The problematic connection between the university and Kaijonharju has been eliminated by moving the commercial services and the activities centring around them to the parking lots currently dominating the section between Yliopistonkatu and Erkki Koiso-Kanttilan katu streets. This creates a salient centre point for the area, accessible by excellent public transport services. The entry is also ecologically and economically sustainable, as it requires only a limited amount of new infrastructure. The construction of new student housing can start immediately, while the existing ones remain in use. The forests can be developed into urban forested parkland that complements the area’s identity. The existing building stock is easy to gradually upgrade block by block according to the new concept. 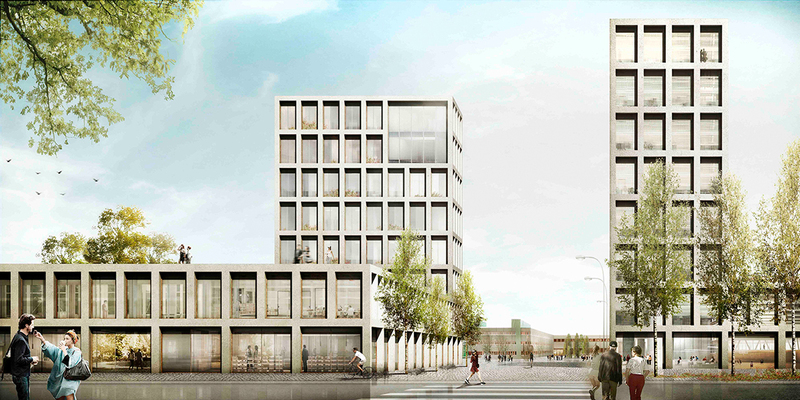 The architectural concept is based on the modular grid and it harmonises with the structuralist architecture of the Linnanmaa university campus. The courtyard typology gives the new blocks a separate identity independent of the existing building stock, creating a smaller and therefore more suitable scale for residential use. However, the entry suffers from a number of flaws. The number of residential units and parking spaces is far too small, while there is an excessive number of the hybrid blocks and covered courtyards that are tricky to execute. Pedestrian and bicycle routes, public transport connections and parking have not been given due consideration and the development and use of the shoreline of Pyykösjärvi, green spaces and public outdoor spaces have been neglected. Based on this concept, the requirements in the competition brief can, however, be developed further without compromising the carrying theme. In other words, there is nothing in Kaljama that would actually undermine the further development of the areas as required in the competition programme. Hybrid blocks can be changed into residential ones and the courtyard can be left uncovered. 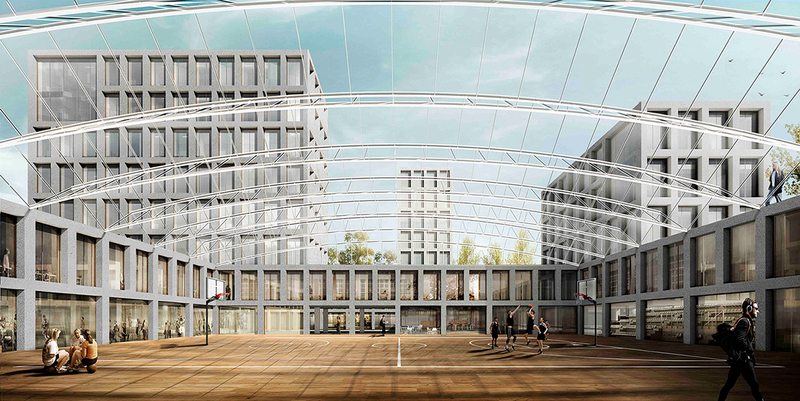 Despite its shortcomings, Kaljama is not a theoretical curiosity but a fully feasible strategy that could produce new, architecturally impressive and functionally exciting environment. 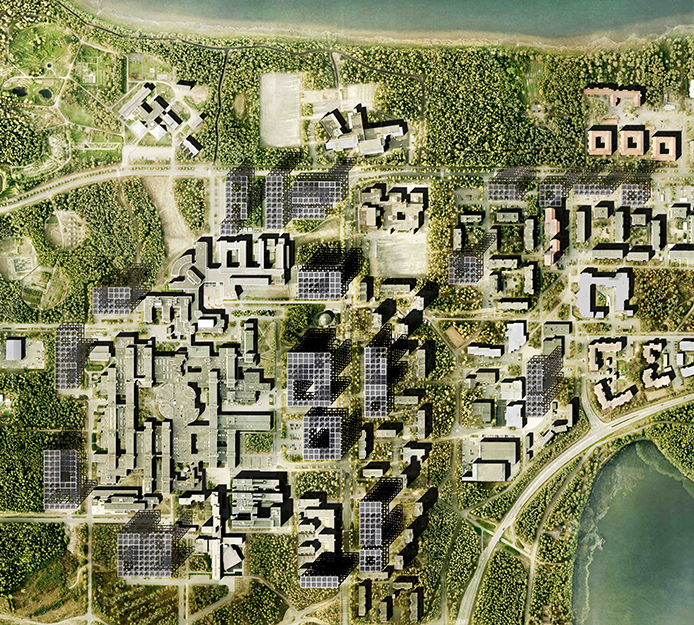 The jury recommends that the first few stages of the Linnanmaa regeneration be based on the concept of Kaljama: replacing parking lots with residential and hybrid blocks including commercial and public services and thereby shifting the new centre onto the most central spot of the Linnanmaa-Kaijonharju district. Kaljama, a thick layer of ice on the floor. Once the ice had disappeared, the sun warmed the earth and the first plants grew. With the plants came the animals; And with the animals the people. Therefore, the history of the human being began in Finland. In Finnish there are more than 50 words that refer to “snow” or to any type of frozen precipitation. This wide variety of definitions materialize concepts in a culture strongly linked to nature. Kaljama is not an isolated project. Its logic belongs to a larger scale project that intensifies the link between the campus, the existing housing programs and the city. The project is not interested in demolishing but in revaluing the existing constructions. This is achieved by a spatial concentration of new hybrid architectures that allows a sharing of productive amenities, greater social interaction and knowledge accumulation that turns Kaijonharju and Linnanmaa into a whole and more complex productive district. The preference for functional complexity and compactness, far from being translated into an opaque mass of built constructions, has led to the formation of a porous architecture made of lightness, patios and concrete. The anonymity of the façade borrows its language from monumental architectures, offers an expanded urban profile and a transition between the public and the private, the street and the living space. Each new building is organised by a public program that materialize in its patios and makes them distinctive and different from each other. Therefore, each building works as an independent centre but when working together they generate an active and systemic urban network. Eventually, the buildings become an architectural and urban experience where the user realizes the vast range of public and private gradients.